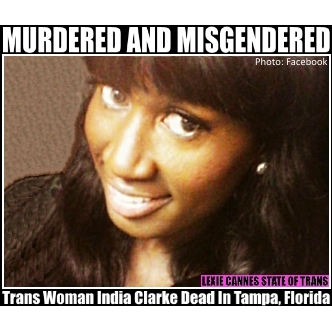 LEXIE CANNES STATE OF TRANS — A body found near a community center basketball court in Tampa, Florida this week is that of trans woman India Clarke. While the cause of death is still not known, there was blunt force trauma to the upper part of her body. At this writing there are no further details or suspects. UPDATE: Oct 27, 2015 — A suspect has been arrested in the murder: Keith Lamayne Gaillard. The victim died from a gunshot wound to the head. Maza: The cycle at its worst seems to be the same: a transgender person is found dead, law enforcement officials fail to acknowledge the victim’s gender identity, and local news outlets follow law enforcement’s lead, misgendering the victim despite often knowing how the victim wished to be publicly identified. Trans women of color are at the very bottom of the socio-economic ladder, although it might be argued that it’s kind of a free-for-all down here; people stepping on each other’s faces just to reach the first rung. From a distance–a nice, safe white-privileged distance–I’ve seen some examples of the devastation trans women of color experience. We white trans women think we’ve got it rough? We can at the very least find acceptance among ourselves and a larger community. But there is no “trans women of color” community. I can say this with some accuracy, I think: there is NO justice for trans women of color unless they’re waaay up that economic ladder and even that is just another damn media illusion. Laverne, Janet…they are no more safe than their sisters at the bottom: in the free-for-all, struggling to survive. Trans women of color are, in fact, the easiest target of all for our adversaries, surely because they are the most deprived. Personal note: Lexie, would you please email me? I have some questions I must ask relating to my new book and I don’t have your address available. Thank you.